1977: MEHER Capacitors Pvt Ltd is established; First LV Power Capacitor manufactured with in-house technology. 1978: Commercial launch of LV Power Capacitors – with Paper/Foil/PCB Impregnant technology; Marketing agreement signed with NGEF Limited. 1980: Commercial launch of LV Power Capacitors – with Film + Paper/Foil/non-PCB Impregnant technology. 1982: Development of Metallised Polypropylene LV Power Capacitors. 1984: Development & launch of Automatic Power Factor Correction Systems with Analog controls. 1986: Development & launch of Automatic Power Factor Correction Systems with Microprocessor based controls. 1987: Commercial Launch of dry type LV Power Capacitors. 1988-89: Setting up of a new expanded Manufacturing Plant for production of HV Capacitors with Film Foil technology & LV Capacitors. 1990: Delivery of 60 MVAr ( 2 x 30 MVAr) HV Capacitor banks for 400kV station application. 1991-93: Significant deliveries of HV & LV Products & Systems to important projects. 1994: Restructuring plans & new strategy to transform into a Power Quality Products & Systems business; Marketing agreement signed with LARSEN and TOUBRO LIMITED for LV Standard Products. 1996: Launch of Technical Services for PQ System Studies & Analysis; Launch of Harmonic Filter Products & Systems. 1997: Creation of “High Power Testing & Research Lab” – with testing capacity of 5 MVAr. 1998: Launch of several varieties of product variants; Launch of new generation APFC & Harmonic Filter Systems; Launch of “Dynamic Compensation Systems” and commercial launch of “Cylindrical type” LV Capacitors; Succesfully delivered advanced PQ solutions for Industry, Buildings & Infra Projects. 1999: In house production of Iron Core Inductors begins, Operations rationalised across 3 manufacturing locations in India; Multiple warehouses set up in India & Middle East to improve logistics, New Manufacturing facility set up in Germany; Significant Expansion in “Customer Training Activities on PQ Management”. 2000: Emergence among market leaders in the business of PQ Products & Systems with strong presence in India & other markets, Launch of “PQ Expert” software Platform that enabled Power System Simulation & PQ evaluation. 2001: Commercial launch of next gen LV Capacitors – Cylindrical, Dry type/Gas Impregnated, individual ratings going upto 50kVAR/unit. 2002-06: Expansion of Capacity – LV Products – 12,000 MVAr/year; HV products – 3,000 MVAr/year. 2007-08: Market Leadership (Quantitative & Qualitative) & Global relevance – firmly established. 2009: MEHER Group transfers MEHER Capacitors Pvt Ltd to SCHNEIDER Electric. 2009: Change of Strategy & Business Approach finalised & new efforts commence; The MEHER Group Holding Company – MHM Holdings Private Limited is formalised. 2009: Formal structuring into 3 focus areas – “ENTERPRISE” – for Engineering & Technology driven Businesses; “ASSET MANAGEMENT” – for all Investment activities; “CARE”- for assisting people in need. 2009: MEHER Advanced Materials Private Limited starts manufacturing “Thin Film Metallised Dielectrics”. 2012: MEHER & KENDEIL, Italy – form a Joint Venture – “Kendeil IndFarad Electronics Private Limited” – to manufacture “IKEN” brand Power Electronic Capacitors. 2013: MEHER & MANGOLDT, Germany – form a Joint Venture – “Meher Mangoldt Inductors Private Limited” – to manufacture Power Inductors. 2016: Meher Mangoldt Inductors Pvt. Ltd. signs a Sales Agreement with Coil Innovation, Austria for Air Core Inductors used in Electrical Power Transmission & Distribution Systems. 2017: Meher Advanced Materials Pvt. Ltd. sets up a Marketing Joint Venture with Sungho Electronics Corp, South Korea with a focus to grow the business in high-end applications by offering a variety of specialised dielectrics. The JV is Headquartered in Seoul, South Korea. 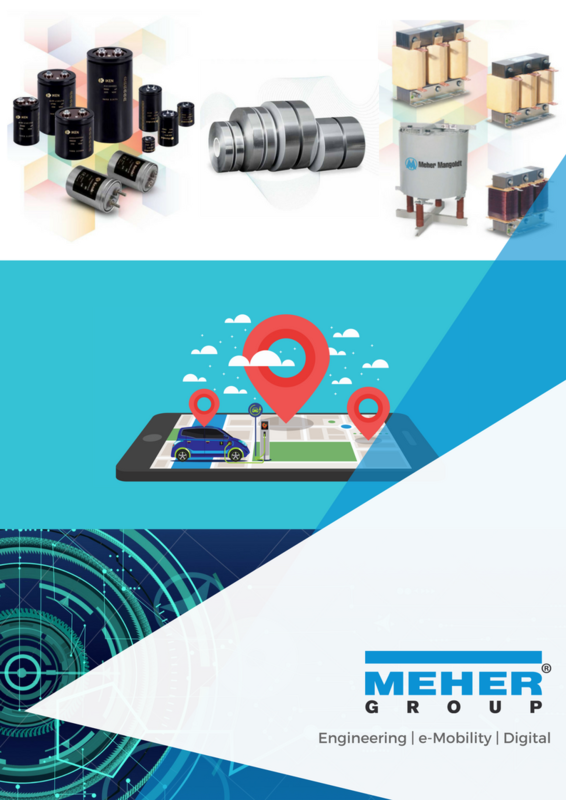 2017: MEHER & DEKI Electronics Limited form a Joint Venture – “iPEC India Private Limited” – to manufacture EV Chargers & offer Hardware + Software Solutions for the EV Charging domain and to manufacture Power Trains for Light Electric Vehicles. 2018: iPEC enters into a strategic partnership with L7 Drive Oy, Finland to manufacture in India, next generation electric drive systems with unique technology for a variety of EV’s in a variety of markets. 2018: MEHER enters into a strategic partnership with Innohabit to work together to offer Machine learning and AI based analytic solutions in the above areas. 2018: MEHER enters into a Joint Venture with Basemark Oy, Finland to offer advanced AI based software solutions for “Big Data Visualisation – Augmented Reality & Virtual Reality” in the above areas.